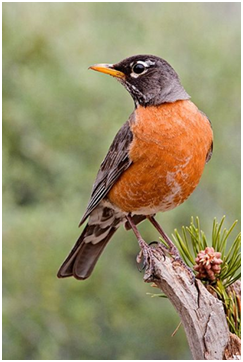 The American Robin (Turdus migratorius) is one of the most abundant birds of the Thrush Family (song birds) in North America. In Sept 2012, the Alberta Canadian Cooperative Wildlife Health Centre received a dead American robin found within the city limits of Calgary, to examine, but it was not immediately obvious what caused the death of this bird. On further examination, the intestine was found to be filled with approximately 25 parasitic worms of Plagiorhynchus species. These worms belong to the group called Acanthocephalans (meaning: thorny headed worm) which are characterized by an elongated mouth part that is armed with minute spines. 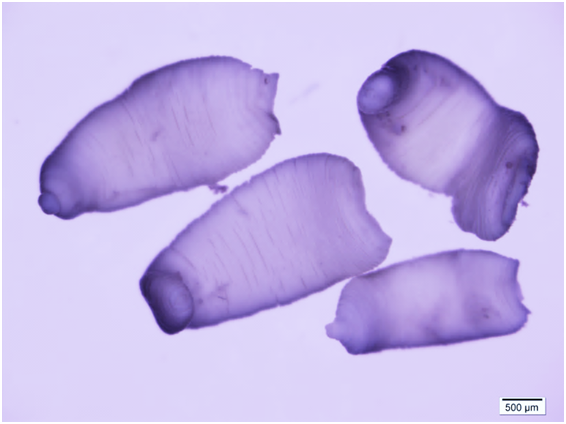 The most important acanthocephalan parasite that causes disease and death in American Robins is Plagiorhynchus cylindraceus. The life cycle of P. cylindraceus involves robins and other songbirds as final hosts and insects like pill bugs (Armadillidium vulgare) as intermediate hosts. The worm’s eggs are voided in the songbird’s feces and eaten by pill bugs. Subsequent development of larvae inside the bug causes behavioral changes so that they wander into the open (rather than remaining hidden from view), and more easily are found and eaten by birds. 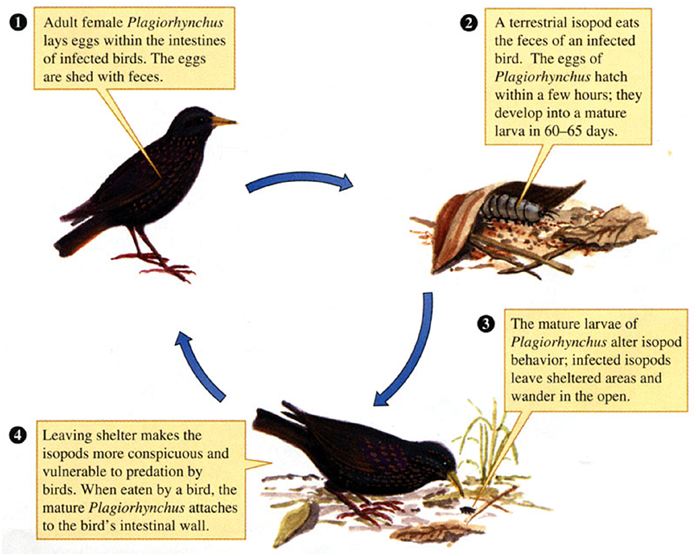 When songbirds consume the infected pill bugs, the life cycle is completed in their intestine. Little is known about how these worms cause disease and death, but this is not the first time disease has been associated with these parasites ( see 2009 USGS Report here) When unusual mortality events affecting songbirds occur, the potential for this intestinal parasite to be the cause should not be overlooked. A new hookworm in black and grizzly bears in western Canada? Great description of the parasite. Most likely this was a young bird with a first time infestation. Unless this parasite is new to songbirds and there are are circumstances that increase the exposure to infectious stages I have a hard time believing in parasitism as cause of demise. Perhaps they are a symptom of change in the population of robins rather than the cause of terminal disease. I have seen a very dramatic decline in robins in my Berkeley Springs, WV area this year. I’ve seen only 1 robin in my yard (one that has been coming back for a few years) and she looks awful. She and her mate (who I have not seen) usually build a nest in my trees, but there are no robin nests around, no robin mating songs. There is such a void here. It is dreadful!!!! I really miss them. I’m afraid I will not see my little robin for very much longer. Is there anything to do? If you think there is a population decline of robins in your area I recommend you contact your local Fish and Wildlife office, rehabilitation center and/or bird watching societies and let them know your concerns. They may have resources to investigate or at least will make a report to see if multiple people are noticing the decline. June 2017. I am visiting this site and others this morning because the robin population in my valley in La Fayette NY has definitely collapsed. I hoped for an answer. Previously around 4:30 each June morning my valley was filled with the robin chorus so loud and so complex I could not distinguish individual singers. This year I hear a robin or two in the distance. Eventually a robin nearby sings. Where are the rest?